What if you could really feel the magic at Christmas? How can Christmas time, from now until New Year’s, be magical for me? What if you paused for several moments and thought about Christmas? Okay, seriously, all this chaos? All this planning? Who’s having dinner what night? What do you mean you can’t come? How can it be Christmas without snow? Did I get the kids equal amount of gifts? Oh, damn the baking… I have to get to that! Okay, It’s Christmas time. We don’t say those things out loud. Well, some people do, or how else would I know this? What if the whole month had many peaceful moments? What if you spent more time with hot chocolate by the fire than with coffee at the mall? What if you looked at the ‘traditions’ in your family and weighed out their value? Do some weigh really heavy… like tipping the scale so far that anything placed on the other side flew off so fast and so far it would land in the North Pole? Can you let any of the weighty items go? Can you choose to have more of the things you love? What if you chose to notice the magic? What if you really could feel the magic? Posted in Christmas and tagged finding the magic of christmas, janet whitehead, surviving Christmas. Bookmark the permalink. Inspired by a trip to Disneyland with my Granddaughter. 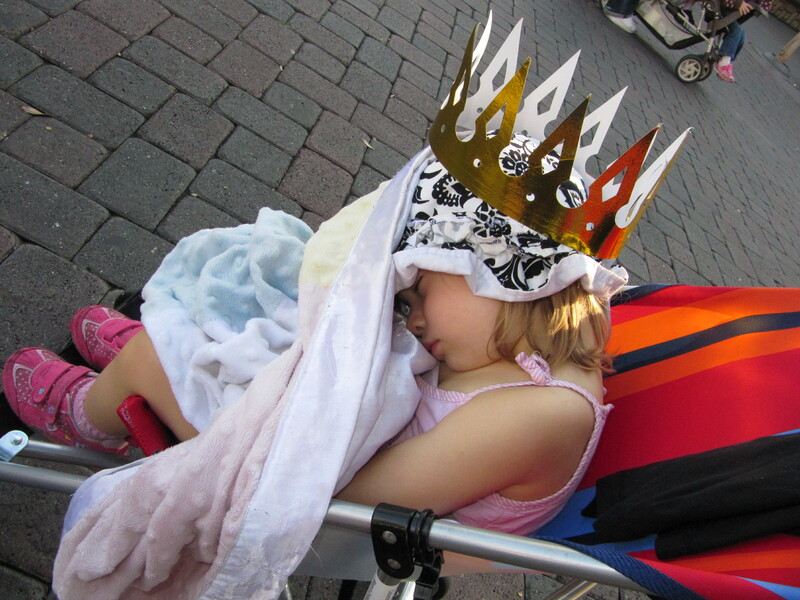 If we could live life like a 2 ½ year old in Disneyland, we’d go to magical places and be entirely in the moment. We wouldn’t be rushing to get to see everything, we’d be happy to just be wherever we are. We’d trust those that guide us, even as we go somewhat cautiously to rather loud and dark and exciting places. We’d just cover our ears if it’s too noisy, and we’d curiously notice all that is around us. Sometimes we’d be so curious, we’d end up somewhere that scared us, but our guides would cuddle us and speak soothing words, and we’d know that we are safe. They’d even remind us that we can stand tall, announce ourself and say “you can’t scare me!” Or we’d learn to growl like a tiger at tigers that growl at us because that’s quite fun. When we are tired in the middle of the day, we’d just cover our head with a blankie and nap. (A stroller works great.) When we wake, we’d wonder what’s for dinner and we’d know that food will arrive. It’s okay if it isn’t shaped like a Mouse, but it’s funny if it is. Sipping milk through a straw that turns colour with each sip is also great fun. And we just aren’t going to eat a thing if we aren’t hungry, no matter how much someone might want us to. And if its fresh buttered popcorn we want, then it’d be fresh buttered popcorn we’d eat. 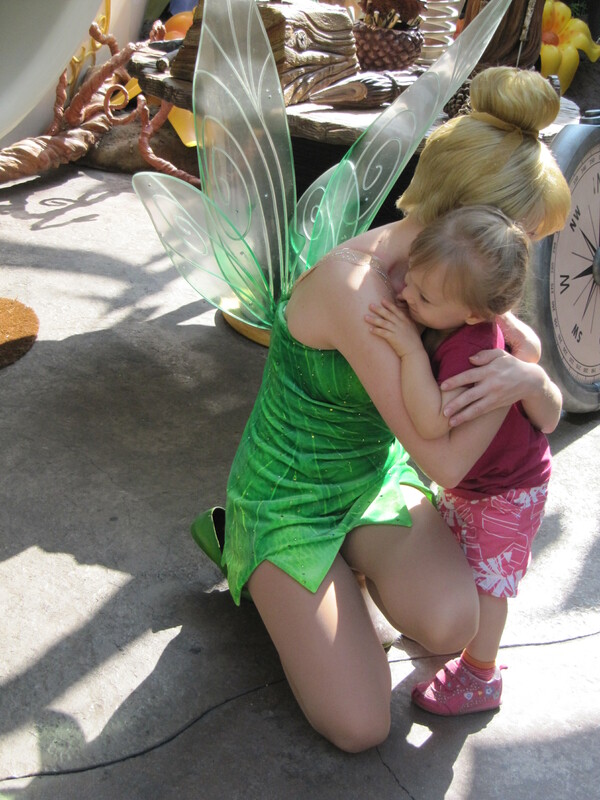 Oh the excitement when we really see magical beings… whether they are faeries or princesses or great big fuzzy bears. Sure, we’ve never doubted their existence, but we’d be so pleased to meet them here… and they’d be pleased to meet us too.. because they’ve run into people often enough who don’t believe in them, so it’s lovely when we arrive and know that they are real. We’d be so intrigued by the stories told in castles that later we’d re-enact it and make up our own stories with little toy characters – loving every minute of our imaginary play. We’d notice as we walk that we have a really lovely shadow and we’d run and hop with it in the middle of the street.. so entranced we wouldn’t even notice the other people trying to get by us. And they wouldn’t mind that we might hop right in front of them, because .. well… they are in a magical place too. When we don’t feel like dancing, we’d say so. 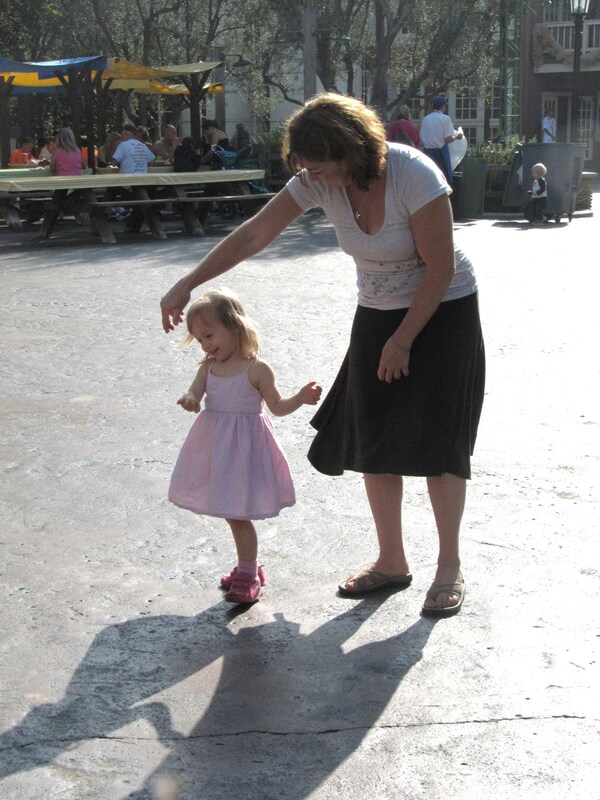 And when we do, we’d grab our Nana and dance together twirling and singing and laughing. We’d climb mountains, swing on rope swings, and try to scale anything that looks like it has a foothold. In the moment, practising our balance on a little wall has the same value as a wild boat ride. But oh, the wild boat rides are delightful.. full of mystery and intrigue and waterslides. “Oh my! I love that song,” we’d think. Then we’d sing “Yo ho yo ho” and “Once upon a Dream” whenever and wherever we feel like it. Opening Nana’s locket and asking Papa’s spirit to join us on the boat ride would be as natural and normal as having lunch. And you’d be happy because Nana would be smiling that special way, and you’d know something you did has given another person such joy. 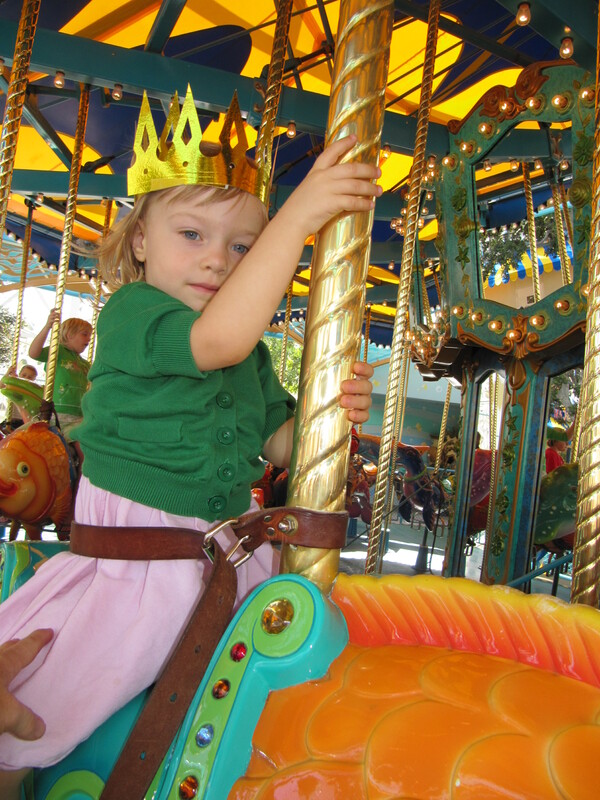 And if we wanted to, we’d ride a gilded horse over and over and over again and no doubt be crowned ‘Princess of the Carousel.’ Yes, others would happily acknowledge our joyful spirit. We’d be full of wonder and laughter as we watched Aladdin and Jasmine and Genies dance and sing and the next day we would hug Jasmine dearly because now that we knew her story we would feel just that much closer to her. When streamers and glitter are tossed in the air during magical parades, we’d run to gather them before the cleaning people could get to them! Then we’d twirl, and scrunch, and toss our streamers into the air before giving them to our guides for safekeeping. When we’d travel to a little island, we’d be happy to sit in the dirt and talk to the ducks because they are as magical as the faeries. And when someone announces “Oh, look a treasure chest!” we’d notice it’s full of flat round things and we’d yell “Cookies!” because we’d know what would be the ideal treasure for us. If we lived our life like a 2 ½ year old in Disneyland, we’d be in awe of how bright and beautiful and exciting and full of cookies the world can be. And we’d never doubt even a moment that our guides are looking after us while we get to experience all the wonder and magic and adventure that the world holds. And we’d laugh as we hugged our guides often, and giggle as we hugged ourselves too. May not be copied without written permission from the author. 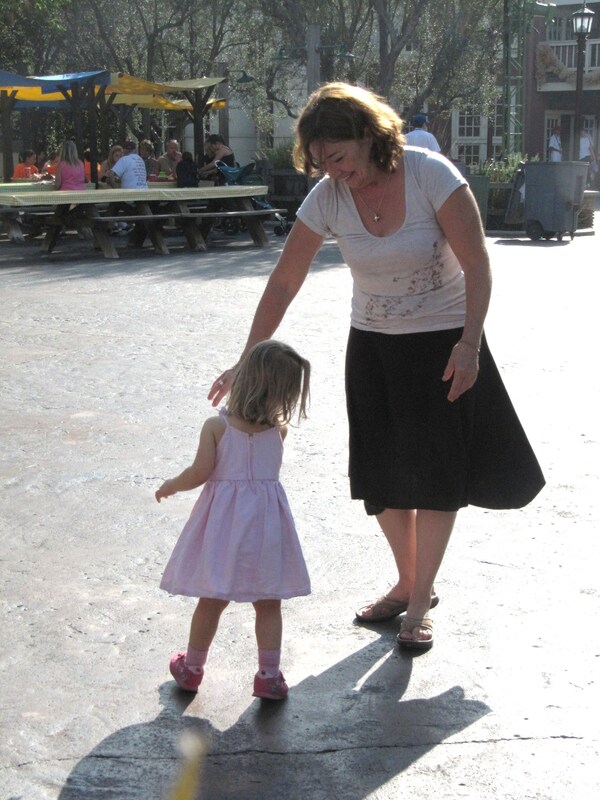 Posted in Brilliance of Babies and Children, Empowering you, me.. and tagged children can teach us about life, disneyland with a two year old, janet whitehead, learning from 2 year old, living magically, trusting our guides. Bookmark the permalink. I’ve struggled with the ‘name change’ issue forever. As a child I used to imagine that I would miraculously marry a man who had the same last name as me! As it turns out, I have good reason to have an issue with this. How ridiculous is it that names carry on only through the males? How sad that my father was sad that the lineage of his last name ends with this generation. That bothered me because we women are carrying on the genes just as much as the boys do… but the ability to track the family history will get more and more difficult. After my divorce I went back to my birth name. It felt right. I did however have to do a ‘magical name changing’ ceremony to honour that change and to acknowledge that having a name different from my daughters held some grief. But alas, I knew that they too might change their names, anyway and so I changed to my birth name. And now each of us have different last names. Courtney loves her married last name and of course has the same name as her daughter. Megan has her birth name. This is all very annoying. Why? Because the other day I was with a group of people and they were talking about Megan and the Mongol Rally Girls.. and they did not know she was my daughter until I told them. And I’ve been in the same situation with Courtney who writes for a magazine. I want kudos for these two girls! I want people to know they are my daughters! I want recognition for being their mother! After these couple of incidences I wanted to put an ad in the paper saying I was their mother. But instead, I’m blogging about it right here right now. Please note: Megan Unruh and Courtney Charlton are my daughters. Evalee Charlton is my granddaughter. And let’s go one step further.. Avee Boyle and Finn Boyle are great niece and nephew. Their mom Shandee Whitehead is my niece.. but that one we can connect easier since her and I have the same name. Okay? Everybody got that straight? Thanks. I think the only reasonable way to resolve this whole naming issue is for everyone to keep their birth names. This is a far more common practise throughout the world, it appears from my bit of research, than actually changing names. THEN, if a couple has a daughter the child is named after the mother. If a boy, then named after the father. I’ve heard this system exists and is used in a variety of countries – but I can’t actually find the research to back that up. Doesn’t that make a lot more sense? Isn’t that more fair and reasonable? My advice to the next generation is to do exactly that.. UNLESS , I suppose, if the man or the woman doesn’t love their birth name anyway, marriage is a great excuse to change it. I’ve ranted. Thanks for listening. and the comment below has me rethinking this whole thing once again. Siblings… It’s nice for them to have the same last name…..
No wonder this is such a challenging issue – I can’t even get clear on what would be ideal! Posted in Random acts of Blogging and tagged Courtney Charlton Megan Unruh and Evalee Charlton are related to me, last name of children, marriage name change, should i change my name when married. Bookmark the permalink. Here’s a very cool technique to find answers and because you will be accessing your creative soulful right brain, it’s going to feel like magic. Part one. This stream of consciousness technique helps you access that creative soulful side that knows so much but is seldom heard. Often we are looking for answers but we aren’t really clear on the questions. In one sitting, write 100 questions. When it gets hard..(like at #10!) be playful. You can write things like “who is this stupid Janet, anyway?” or “What kind of spider is that on the window?” This results in your left brain deciding that it doesn’t need to be all that involved in this silly adventure, and your right brain starts to take over. When you are done, if you don’t have ‘aha’ moments, and some answers (yes, via questions) to your current situation, show the list to a trusted non-judgemental friend. (a person whose life isn’t going to be affected by your choices) Often they can see what you can’t. Part 2 – Just to bring a little more magic into this, pick one question from your list and turn to page 54 of any book of any genre you feel inspired to open. 95% of the time when I’ve offered this in a workshop, people find an answer. Why page 54? It’s just a random number I picked. Funny how random leads to great things. You can play with this in a variety of ways if you’d like to keep using this technique to get answers. You could ask a friend to give you a number between .. oh say, 12 and 100. Or use whatever random method you like to come up with a number, including (if you aren’t going to spend a bunch of time second guessing yourself), just choosing any number that pops into your head. And the books? Wander through a bookstore, your bookshelves, or even a friends bookshelves. Whatever book you choose will be the right one, whether it’s a dictionary, a novel, an art book, a children’s storybook or crossword puzzle book! There ya go. Go Play. Posted in Empowering you, me.. and tagged janet whitehead, life coach canada, life coach kamloops, magical ways to find answers., stream of consciousness tool, what is the question. Bookmark the permalink. It all happened innocently. My intrigue with our addiction to farmville – including my own (which was a bit too brief to be included in a New York Times article.. but it did get me an interview!).. No. Wait. Stop right there. It was not my addiction to Farmville that got me the interview. It was my blog posts about Farmville. The posts were never meant to attract readers or a NY Time’s journalist. I simply like to contemplate how our minds work, what empowers us, what distracts us (especially related to creative right brain thinkers). That’s all. Farmville quickly became a huge distraction to (at the time) 40 million + users a month. How could this not interest me? Sure, the blog posts are entertaining, with tips and humour ( I know this because the NYTimes journalist said they are ‘entertaining stuff.” How cool is that?) .. but there was never an intention to reach readers of my blog. Well, be darned if I don’t have 100 – 200 readers a day now. Point of story? Write from your perspective about very popular topics. There’s something you are already doing, no doubt, that millions of others are interested in. And tag well. (How else will they know you are writing about this topic?) For example, do you have something brilliant, controversial or unique to say about “New Moon” from the Twilight Series? Better yet, are you a vampire? You could get a sh-t load of readers writing about that. You’d think that millions of others would be interested in what I do in my non-farmville life. Oh. I mean, my real life. But alas those millions have not yet found my blog. Maybe it’s all too general – this coaching, self discovery, creativity thing. Oh my, I just had a most Brilliant Idea! You’ve just witnessed the epiphany… .. must run, I’m off to create an facebook app for that…. Posted in Random acts of Blogging and tagged blogging tips, creativity coach, facebook apps, farmville, how to get blog traffic from Farmville, janet whitehead, kamloops life coach, life coach, musings and mud coaching studio, personal coach, twilight new moon. Bookmark the permalink. 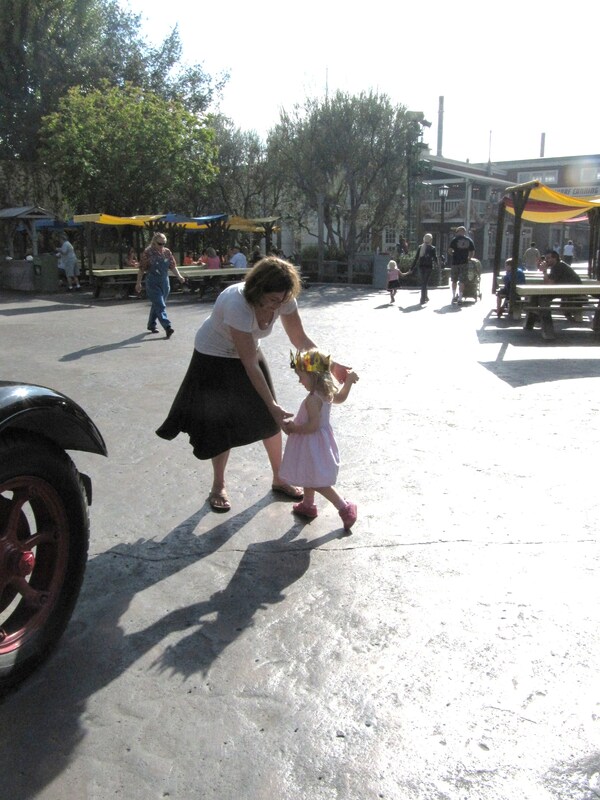 Exploring childhood – Come on, adults, it’s a good thing! If you were asked to go back and look at your childhood, what’s your first reaction? Is it one of these? Is this about finding parents at fault for where I am today? I don’t like the sad memories. As a coach, I notice this sort of reaction regularly when I invite people to explore their childhood. And so, I’ve learned to clarify my idea as quickly as I possibly can – stating that we are doing something very different from the preconceived notion that exploring our childhood is a hard, sad, difficult thing meant to ‘fix’ us. Instead of searching out problems, we are exploring passions and strengths. Because, as a kid, we knew. As children, we were drawn to our passions, and wanted so much to use our strengths. We arrived on this earth knowing this stuff.. we just lost track of it in this world of people teaching us to ‘fit’. That’s whats sad. Because of the negative concepts that ‘exploring childhood’ brings up, it is easier to do (and oh so much fun!) with a life coach. But if you are on a mission of self-discovery, remind yourself often of this: Exploring your childhood isn’t about fixing you, it’s about reconnecting with the brilliance of you! Find your way to do that playfully, creatively, and joyfully. Posted in Empowering you, me.. and tagged exploring childhood, life coach kamloops, what are my gifts, what are my passions, what are my strengths, workbooks to discover passions and gifts. Bookmark the permalink. Dear Farmville.. are you serious? SEriously. Now the barns store things. After all my brilliance of ‘storing’ animals in the barn, now you’ve made it easy. Just like my crop circles. I do think you ought to hire me. So will you be providing ready made labyrinths next? However, I did not come up with a carnival before you did. Kicking myself for that one. Posted in Random acts of Blogging and tagged farmville. Bookmark the permalink.